These images from the Selene videogame show some of the stages in the formation of Earth’s Moon. Image copyright 2013 Center for Educational Technologies, Wheeling Jesuit University. This material is based upon work supported by the National Science Foundation under Grant No. 0814512. Portions of CyGaMEs Selene software are provided under license from Second Avenue Software Inc., copyright 2007-2010, Second Avenue Software Inc. All rights reserved. What better way to learn how the moon was made than to build one? 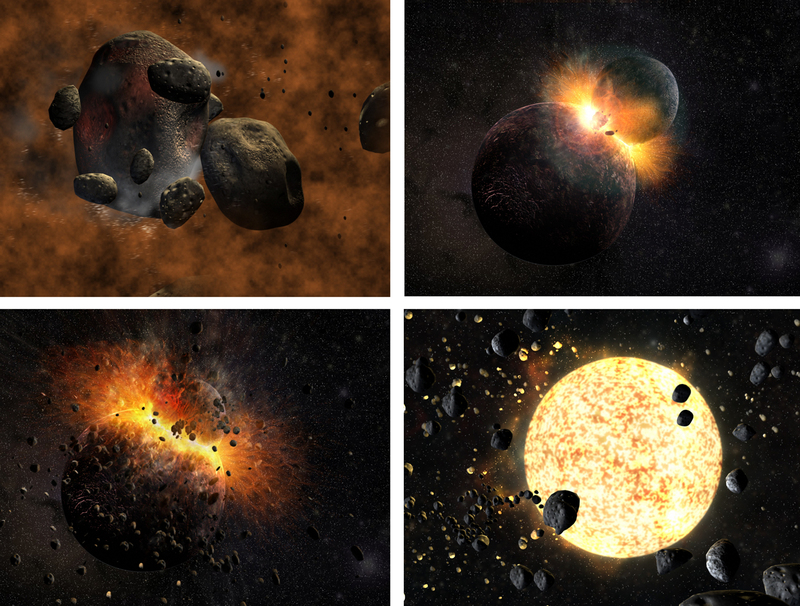 In this online game geared to grade 5–12 students, players create their own moon with raw space materials, then pummel it with asteroids and flood it with lava. As they adjust the rates of accretion —new materials glomming onto the moon— and differentiation— materials of varying densities settling into a core, mantle, and crust— students create different kinds of moons and gain an intuitive grasp of the physics of collisions, says game theorist and principal investigator Debbie Denise Reese at Wheeling Jesuit University in Wheeling, West Virginia. The Cyber-enabled Teaching and Learning through Game-based, Metaphor-Enhanced Learned Objects (CyGaMEs) project was successful in measuring learning using assessments embedded in games. CyGaMEs quantifies game play activity to track timed progress toward the game’s goal and uses this progress as a measure of player learning. CyGaMEs also captures a self-report on the game player’s engagement or flow, i.e., feelings of skill and challenge, as these feelings vary throughout the game play. In addition to timed progress and self-report of engagement, CyGaMEs captures behaviors the player uses during play. Reese et al. (in press) showed that this behavior data exposed a prototypical “moment of learning” that was confirmed by the timed progress report. Research using the flow data to determine how user experience interacts with learning is ongoing. The Selene videogame created by the CyGaMEs project at the Center for Educational Technologies at Wheeling Jesuit University has earned top honors in the games and apps category of the International Science & Engineering Visualization Challenge. 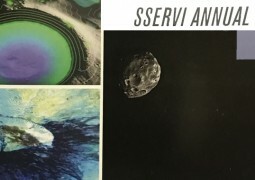 The National Science Foundation (NSF) and Science magazine created the International Science & Engineering Visualization Challenge to celebrate the grand tradition of science visualization and to encourage its continued growth. The challenge invites researchers, illustrators, photographers, computer programmers, videographers and graphics specialists from around the world to submit creative illustrations, information graphics, interactive visualizations and videos that intrigue, explain and educate others about science. This year’s competition received more than 200 entries from 18 countries. Selene: A Lunar Construction Game received an honorable mention award in the games and apps category. Winners were featured in the February issue of Science as well as on its companion website, Science Online. The first version of Selene was a semifinalist in the 2007 International Science & Engineering Visualization Challenge, before winning this year. The game originally was funded by NASA to study how to best use videogames in the teaching of NASA science concepts. The current version of the game is now part of the NSF-funded CyGaMEs project, an approach to instructional game design and embedded assessment. In Selene players learn difficult geological concepts like accretion, differentiation, impact cratering and volcanism by applying these science concepts through gameplay that helps players move toward the game’s final goal of building the Earth’s Moon. Players construct the Moon, then blast it with impact craters and flood it with lava to experience how our Moon formed and changed over time. All through the game Selene tracks each player’s behavior to measure learning and the player’s response to the game environment. The game features the work of three accomplished scientists. Reese created the assessment and instructional concepts of Selene and has earned national awards for the game’s design. 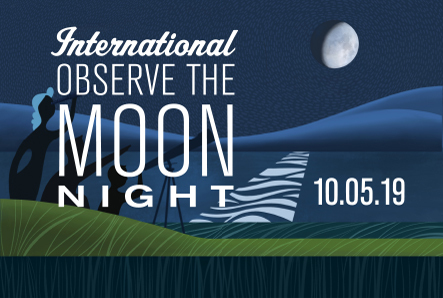 Chuck Wood, director of the center, is a renowned lunar scientist who spent years with NASA training shuttle astronauts on lunar observation, and he also operates the Lunar Photo of the Day website. He guides players through Selene in a series of video segments that explain the Moon’s geological history. And Barbara Tabachnick, professor emerita of psychology at Cal State Northridge, has served as a consultant throughout the project. She recently earned the lifetime achievement award from the Western Psychological Association for her 40 years as a research design/statistical consultant. According to Reese, it’s these under-the-hood aspects that make Selene special. CyGaMEs uses a type of knowledge engineering to translate hard science into videogames: to translate what scientists think into a game that learners play to discover and apply fundamental science concepts. The process enables researchers to measure learning as it occurs. This permits CyGaMEs to draw each player’s learning as a visual representation that researchers, educators and even 9-year-old players can understand. Selene recently debuted its Spanish language version. Both versions of the game are free online and available 24-7. Players ages 9-18 and adult recruiters, who confirm players’ ages, get parental consent and gather other players, are always needed to help with the CyGaMEs research. To sign up as a recruiter or play Selene, visit the Selene website at http://selene.cet.edu or contact selene@cet.edu.